More than 50 different illnesses can produce the symptoms of dementia. 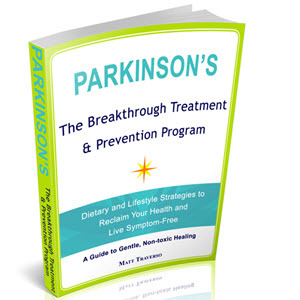 Available studies indicate that, on average, 5% of all causes of dementia are reversible and 11% have some specific treatment available, although not typically resulting in symptom reversal. Among the more common potentially reversible causes are those due to prescription and nonprescription drug toxicity, metabolic disorder, brain tumors, subdural hematoma (a collection of blood under the outermost meningeal covering of the brain), and depression. The more common dementia types that are presently irreversible include Alzheimer's disease, Parkinson's disease, dementia with Lewy bodies, Huntington's disease, frontotemporal dementias, vascular dementia, and traumatic brain injury. Autopsy studies have varied in their estimates of the relative proportion of all dementia cases accounted for by each of these causes or types, although all agree that Alzheimer's disease (AD) is the most common. The neuropathological characteristics of AD consist primarily of neuritic plaques and neurofibrillary tangles, as well as neuronal loss. The neuropathology appears to be focused in the medial temporal lobe regions (including the hippocampus, entorhinal cortex, and subiculum) early in the illness course, with progression to the frontal, temporal, and parietal association cortices. Neuronal loss is also seen within the subcortical neurons of the nucleus basalis of Meynert (a major source of cholinergic neurotransmitter input to widespread cortical areas) and in the locus ceruleus (a major source of widespread noradrenergic neurotransmitter projections). Eventually, diffuse neuronal loss results in gross cerebral atrophy, which can easily be seen in autopsied brains, and in structural neuroima-ging evidence of ventricular and sulcal enlargement, such as that provided by computerized tomography (CT) and magnetic resonance imaging (MRI; see Fig. 1). Across several studies, AD alone has been found to account for between 53 and 66% of total dementia cases and may be present in combination with the neuropathology of other diseases in as many as 87%. Vascular disease, typically in the form of multiple infarctions of blood vessels (blockages, with resultant tissue death in the area supplied by the vessel), had previously been thought to be the second most frequent cause. However, more recent studies suggest that multiple infarctions alone may account for less than 2% of all dementias, although contributing to dementia severity, along with coexistent AD, in approximately 13%. 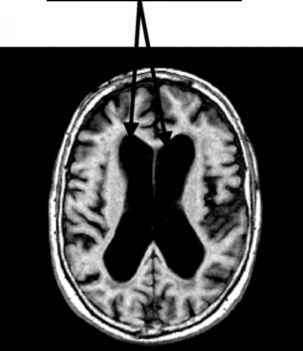 Figure 1 Magnetic resonance image (MRI) showing the greatly enlarged lateral ventricles characteristic of cerebral atrophy in later stage Alzheimer's disease. diffusely throughout the cortex and subcortex when associated with dementia. Autopsy studies have suggested that dementia with Lewy bodies (DLB) might account for 15-30% of all cases of dementia, which would make it the second largest subgroup after AD. The frontotemporal dementias (FTD) include both Pick's disease and non-Pick's neuropathology and account for about 3.5% of all dementia cases. Pick's disease is characterized by Pick's cells (enlarged neurons with displaced nuclei) and Pick's inclusion bodies (round inclusions within the neuron cell body) in frontal and temporal cortical areas. Non-Pick's neuropathology of FTD includes microvacuolation (small holes or vacuoles) or spongiosus (spongelike softening), predominantly in the frontal cortex. Other causes, including Huntington's disease, Parkinson's disease, corticobasal degeneration (all considered among the frontal-subcortical dementias), depression, and several very rare causes, account for the remaining percentage of dementia cases. Within the following sections, the clinical and neuropsycho-logical features characterizing the major dementia types will be described. 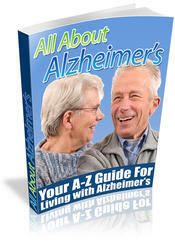 Alzheimer's disease (AD) is a chronic, progressive degenerative brain disease. The most striking behavioral changes of AD include increasing difficulty in learning and retaining new information, handling complex tasks, reasoning, spatial ability and orientation, language, and social behavior. In 1984, a task force assembled by the United States Department of Health and Human Services developed the diagnostic criteria for AD shown in Table I. These criteria now form the basis for standard AD diagnosis in research and have been incorporated into widely used clinical diagnostic criteria (e.g., those of the American Psychiatric Association Diagnostic and Statistical Manual of Mental Disorders, 4th ed.). These criteria have been shown to achieve good sensitivity (against the criterion of neuropathological confirmation), although more limited specificity, in the clinical diagnosis of AD. Early in the course of AD, the most sensitive indicators of cognitive impairment are standardized tests of memory (particularly delayed recall) for recently presented verbal or nonverbal information. This is not surprising given that neuropathology in hippocampal and entorhinal cortices appears early in the illness course and that rapid forgetting is the hallmark of focal damage to these structures in both human and nonhuman animal studies. Several studies now provide evidence that AD has a long, preclinical (i.e., prior to the time when the patient meets standard diagnostic criteria) course, during which subtle memory changes occur. Mild memory impairments, measurable with sensitive neuropsychological tests, thus have been documented in apparently well-functioning persons several years prior to their diagnosis of AD. Similar memory impairments are seen in those presently healthy persons at genetic risk (i.e., showing the apolipoprotein e4 gene allele, a known risk for AD). Of persons demonstrating mild cognitive impairment (MCI), typically defined as standardized memory test performance that is one standard deviation below age-and education-specific normative expectations, between 6 and 25% per year progress to meet diagnostic criteria for dementia (most typically AD). However, preclinical AD is not the only cause, because those with MCI also show higher rates of overall poorer health, cerebrovascular disease, and disability and are more often depressed than those with normal memory functioning.